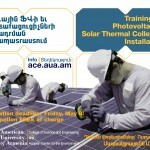 Starting mid-May 2015, the American University of Armenia is installing 3.3 kW photovoltaic and 45 kW solar thermal heating capacity on its Paramaz Avedisian Building. In addition, it is retrofitting its 5 kW photovoltaic system already installed on AUA’s Main Building. 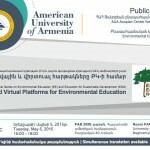 The seminar series is supported by a Norwegian Government grant to develop environmental education capacity in Armenia, including establishment and strengthening of the Environmental Education Network (EEN). 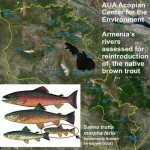 The seminar series is supported by a Norwegian Government grant to develop environmental education capacity in Armenia, including establishment and strengthening of the Environmental Education Network (EEN), a learning partnership between civil society, educational institutions, government, and international organizations.